Departing Circular Quay this cruise aboard Captain Cook Cruises newest Vessel the `Palm Cat’, which can carry up to 220 guests on its spacious indoor and outdoor areas. 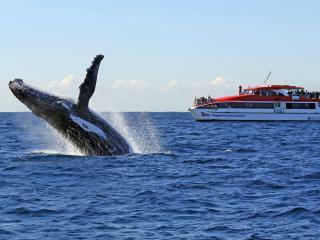 You will depart Sydney Harbour and beyond, which offers an awe-inspiring display from the amazing resident Southern Right Whales and Humpback Whales. Run during whale season as these majestic creatures make their annual migration, this tour cruises from the harbour and out into the ocean, allowing unbeatable viewing opportunities across two outdoor viewing decks for an unforgettable experience. Departs: Daily at 1.30pm & additionally Sat-Sun at 10.15am from Circular Quay, Wharf 6.